When people say they don't like leftovers, I have to imagine that they are eating rubbery, dried out meat with limp and soggy veggies. That is not at all how I eat them. I actually really like leftovers because it gives me an opportunity to re-imagine the dinner into something else. This pizza is the perfect use for not only leftover chicken parmesan, but also any grilled, fried, or baked chicken as well. It is most definitely one of my favorite meals - leftovers or not. And the best thing? It is so flipping easy. Just spread some marinara on pizza dough, top with some chopped up chicken breasts, and then cover the whole thing with mozzarella and Parmesan. It doesn't get any easier. Happy Friday, everyone - here's hoping for a delicious and fun weekend! Place a pizza stone or upside-down baking sheet in the oven and preheat to 500 degrees for at least 30 minutes. Sprinkle a piece of parchment paper generously with cornmeal, and then shape the pizza dough into a 12 inch circle. Brush the outer edge with olive oil. Spread a thin layer of marinara sauce over the dough, and top with the chopped chicken. Scatter the shredded cheese over the top. Bake 10 minutes, or until the crust is golden-brown and the cheese is bubbly and browning. Remove from the oven and allow to cool for about 10 minutes. Sprinkle with basil before slicing and serving. I love left overs too. Can't understand people who think they're gross. Especially when leftovers look like that pizza! I love re-inventing leftovers too. Really helps to make the most of the weekly grocery bill/menu too. This sounds like such a great idea. Bookmarking it to try soon! Mmm, mmm, mmm. This pizza looks delicious. I'm with you on the leftovers bit. It's so much fun discovering new ways to twist them into yumminess. 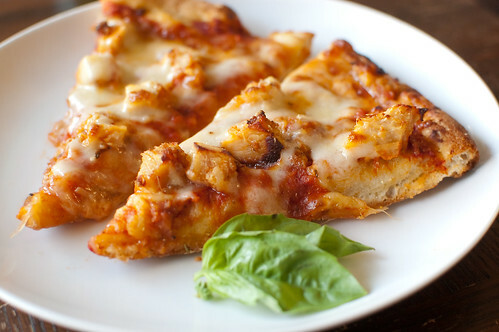 Two of the best things ever: pizza and chicken Parmesan! YUM! I love leftovers! It's a pain cooking for one person sometimes, but I like to cook large batches of certain things and then rotate eating them reheated from the freezer. I am all for saving time and not wasting--so this pizza is right up my alley! And it looks so delicious, too!! I love leftovers too! Both for the sake of having more meals out of one act of cooking, and also because I too like to reinvent my leftovers. 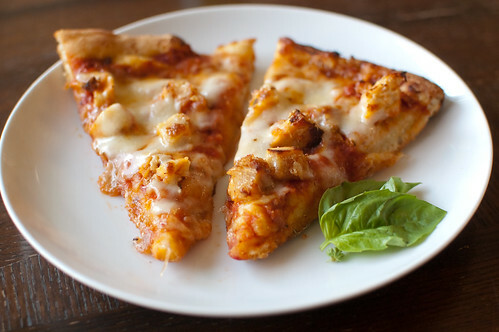 This pizza is great even if you don't have leftover chicken. I agree. I LOVE leftovers! Some things are even better leftover! I love chicken on pizza - it's unique but works so well! Happy weekend! Leftovers on pizza... who can resist??? Given that I cook for one, I ALWAYS have leftovers around...and love them! This sounds like the perfect reimagination of chicken parm! This is brilliant, I need some in my life. Yumm!! Simple and tasty idea - what more can you ask for??! Looks so good! What a great idea to combine these! love it! Do you have a recipe of the marinara sauce? This recipe looks delicious!! This was awesome!!! Thanks for posting this recipe! Oh goodness, what a great and simple idea, Josie! You can just use any marinara sauce - storebought or homemade. If I need some in a hurry I just simmer a can of crushed tomatoes with a few cloves of garlic and some Italian seasoning. If it's too thick I just thin it out with a little water or red wine.